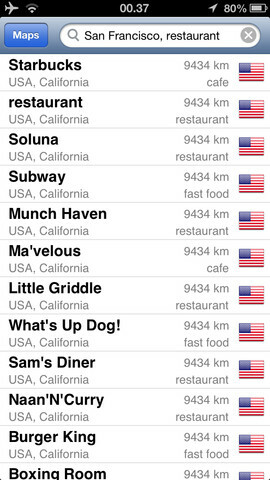 MapsWithMe is an offline maps iPhone app developed by Yurk Melnichek. 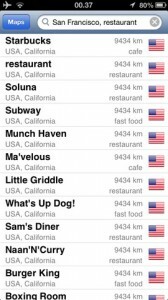 In addition to working in situations where you can’t connect to the Internet, MapsWithMe also bills itself as having the “quickest offline maps of all the cities.” Does it live up to its own claim? When you start up MapsWithMe for the first time, you’ll be asked if you want to display distances in miles or in kilometers. You will then be presented with a global map, which you can pinch in on or double tap to magnify. Strangely, it didn’t prompt me to let the app access my current location until I had MapsWithMe open and running for about 10 minutes. 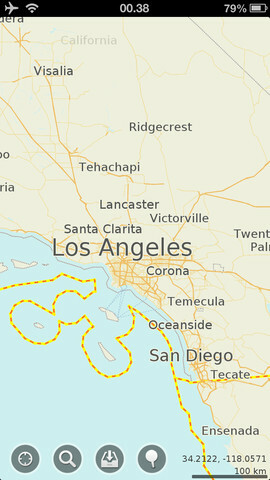 Something kinda funny happened when I used this app with a WiFi connection, however: at a certain level of detail, it asked me to download the detailed map info for my state. The same thing happened when I was in Airplane Mode, except, of course, I couldn’t download the map without a WiFi signal. I know this is pretty standard for an “offline” maps app, but I keep wishing for a maps app that is truly detailed when its offline, as soon as you download it, without having to download each state separately. While the maps did load astonishingly fast, they only do so at a fairly low level of detail. It’s great for a geography lesson, less so for a navigation app if you’re trying to find a certain city street. But for a map app that’s touted for its offline abilities, I found this lack of close-up detail surprising and a bit disappointing. But maybe I expect too much? 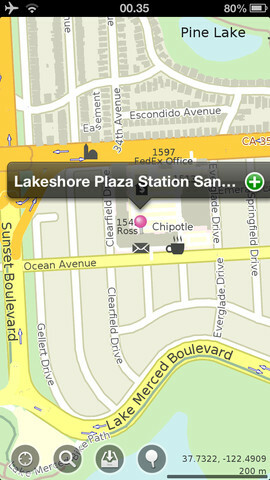 Is it too much for me to hope for an “offline” maps app that’s like having a world atlas in my pocket in the year 2012? MapsWithMe did have very precise longitude and latitude data at all times, which was pretty cool. The auto follow feature is also EXTREMELY handy, and helps to keep you oriented when traveling. MapsWithMe is handy if you know where you’re going, and you’ve pre-downloaded the data from the area you plan to travel through. But if you got lost along the border with another state and didn’t have that other border state downloaded, you could be frustrated. I wish I could have downloaded more map detail by region, rather than by state. Even if it slowed down how fast the new segments were populated, it would have been worth it. 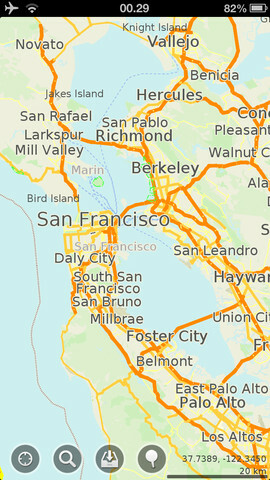 MapsWithMe is beautifully designed, and the maps do load very quickly. It would be a good resource to have in your pocket. In addition to the Pro version we tested, the developers have also released a Lite version that you can try out! 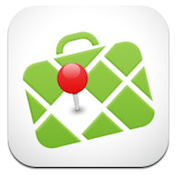 MapsWithMeis compatible with iPhone, iPod touch, and iPad. Requires iOS 4.3 or later. This app is optimized for iPhone 5.